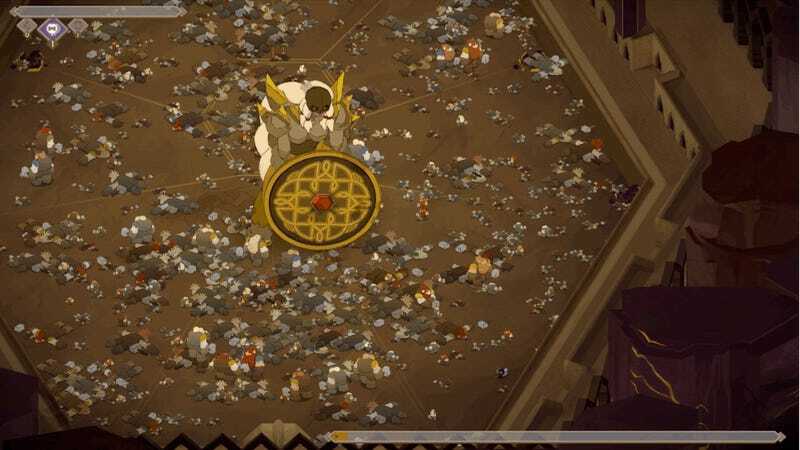 Yesterday I played one of Jotun’s boss battles over and over for 6, 7, 8 hours. I died dozens (hundreds?) of times. I should hate it, right? Nope, I loved every agonizing second of it. Jotun is an action-adventure/exploration game where players control Thora, a warrior woman trying to ascend to Valhalla after she’s died an inglorious death. To gain admission to the Norse mythological afterlife, she has to impress the gods and defeat five Jotun, elemental giants who rule over different realms. I’ve fought two of these big adversaries so far and really enjoyed the steep level of challenge in each encounter. These videos show me taking on Jera and Fe, in the instance where I finally beat each of them. You can see an old-school approach to boss battles here, with different attacks and patterns rolling out as I hurt each giant more and more. I got lucky with the first fight against Jera, finding a spot where I could attack without getting hit. But the battle against Fe was much harder, especially with hordes of dwarves chasing me around the arena. Even when I knew what was coming, it took a lot of skill, timing and patience to maximize each opportunity. I’m going back in to play more Jotun today. Pray to Odin for me.